Actually this is not how I understand meaning of "anvil" in travian. It is a defensive army from one village or defensive account (not an army). Walling is done by several accounts in most cases. I can see that everyone has a very different play style to mine which is why I'm getting so much feedback. Let me say this. The highest I've ever reached in village count is 39 and it was on pkx. I'm sure the old timers would remember the good ol' days of pkx and KR terrorizing the server. In the recent years, my highest is somewhere close to 30. Now, I have built every village with a TH 20 and TO 20 and still have a 500k approx hammer. I did not get to build TC 20's in every village but I did have a few for CP purposes. I always make sure to settle in an area abundant with oasis. And all my vills have 3 oasis. Maybe not the newly settled once but the ones that are maxed out. I don't understand why this is hard for everyone. Sure you have to spend some gold for the upkeep of such an account but it can be done. I have done it and will try to do it again in the near future. I'm an a vicious raider. I have not hit the raider charts in the past year because of college but I'm always in the top 10. I use my raid income to keep my hammer ques 24x7. Its takes time, effort, dedication, and money. But it can be done and I have done it several times. I don't know how you guys play but apparently the difference is quite evident. A huge amount of defence capable of walling a significant off. * I am not going to explain what walling is. Huh how can you not come over 30 villages with this? Also is this speed or not? 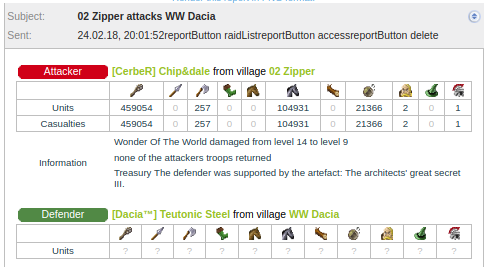 My record is 64 villages on x3 without treasury 20 everywhere or any of this wasteful building and 30+ is super normal on servers i play i'm very confused. Do you quit middle through or what is going on? Oh is this specific for speed servers? Well ... Most of this has been done on speed servers. I have played a few snails but I've never grown as big as I did on speed. So I might be biased. I'll edit the OP and make sure I say this is specific for speed. I know what a anvil is, but i have no idea what it is within travian. Opposite to a hammer, hence the hammer/anvil analogy. A hamvil on the other hand is both... @Marksy_UK can explain better, I believe he found one recently. An anvil is a defensive account that pumps deff from several villages helping it ally in walling, sniping and during deff calls. An account can be called a full fledged anvil after it has over 500k + defensive troops. You need to improve your effectiveness, maybe listen what others tell you. TO and TH and TC lvl20 in every village are all such a waste of resources. Not to mention having 3 Oasis for every village: maybe try to have 50 villages that all have 2 Oasis rather than having 35 villages with 3 Oasis each. You say it isn't that much, but it is quite a lot. Of course people have way more, but people have way less. To say it's not that much just isn't true. I need the TO lvl 20 because I'm a firm believer in Trade routes. My account would be dead without trade routes. That is how I manage to feed my deff troops and sim even further. I need the TH 20 because I run parties 24x7 for more vills. Might not be much to you but I think it's decent. Especially when we pulled out a 500k roman hammer with 30k cats. 500k hammer and 30k cats? I need the TH 20 because I run parties 24x7 for more vills. No way you run 24/7 parties with TH 20 and only get 30 villages on x3. We won that server and I zeroed the enemy WW so I guess 500k hammer did the job just fine? The thing about big account is that people get bored. My duals or I will not play with the same dedication we had when the round started. It's annoying to look at 30 villages and maintain and then hope for more. Schitt happens. Real life gets in the way. Gold shortage. Duals quitting. A good example would be the Bo Jackson account on Uk 3x F&S. Look what happened to that account. It was an absolute monster account in the beginning, it got banned and punished and still came out with the top 10 raiders that week. They were way ahead of anyone and everyone in pop. Look where they are now. The duals had issues and quit and schitt happened. I think everyone can agree that not every round goes exactly the way we planned it. I think he's talking about troop numbers, not wheat comsump. 500k with 30k catas is pretty decent with romans, everyone is allowed to missed a couple queues every now and again. I also rely on my trade routes. Even with lvl10 Trade office (and 3x shipment) you can still EASILY send out every resource you produce, every hour. No need to waste resources to build lvl20 trade office. I also run parties 24/7, but only with lvl10 Town Hall. Still, that got me to 49 villages and 3M praets being built during the round of 3x server (my screen shot shows the account still having 1.7M alive when the server ended) . It's true you earn CP faster when running parties on lvl20 TH rather than lvl10, BUT with those resources you save when not partying that often you can do something useful for the alliance, like building defense. Wow, 30k catas, nice. But was it the old version where the servers lasted way longer than nowadays? About uk x3 i have no idea what is happening and don't really have anything to do with this unless he followed your guide. If you or your duals don't have the patience to build big account your guide is useless and just wasting resources in CP you wont use anyway. Even if the hammer did the job it was still very low amount of troops in regards to the catas. If Madz is right about you are talking about the acually troop numbers it's fine but i understood it as wheat. 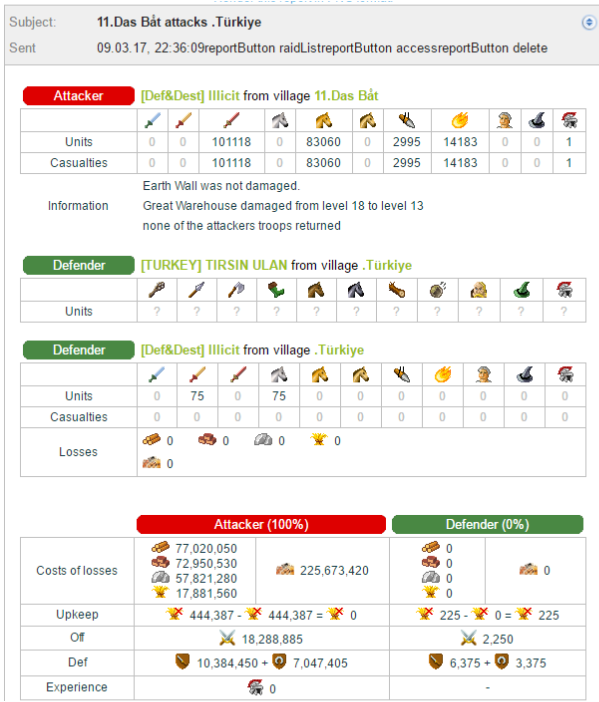 I am a snail Our account ended with 37-38 villages on last 2 regional map servers, note those are 200 days servers so would be more on regular one. Last year we went on speed for the first time and ended up with 47. We appreciate CP value and we build many buildings just for that - population matters by itself on those servers and every village counts . We definitely feed significantly more than 500K troops, but diet is available. We run large parties in every developed village but rarely at TH20 and we never buy artworks. So I understand what you are talking about. However this account is constantly in top10 raiders and this is what makes it possible, not building by itself. I also rely on my trade routes. Even with lvl10 Trade office (and 3x shipment) you can still EASILY send out every resource you produce, every hour. No need to waste resources to build lvl20 trade office.I also run parties 24/7, but only with lvl10 Town Hall. 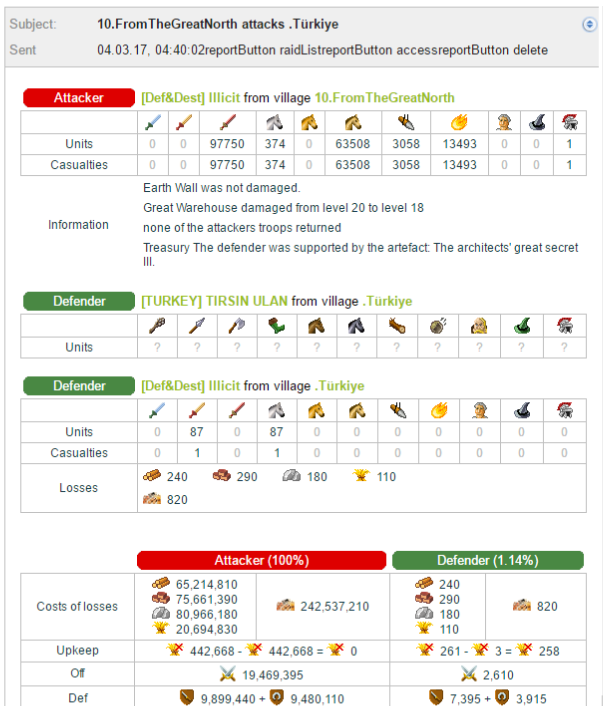 Still, that got me to 49 villages and 3M praets being built during the round of 3x server (my screen shot shows the account still having 1.7M alive when the server ended) . It's true you earn CP faster when running parties on lvl20 TH rather than lvl10, BUT with those resources you save when not partying that often you can do something useful for the alliance, like building defense. I do agree that I dont build a TO 20 for every village. I only build them in support vills. Hammer and Deff vills do not need a TO 20. A TH 20 I do follow. But only in my support vills. In my hammer and deff vills its only 10. I'm talking about balance. I dont mean blindly put whatever you can in every village. Plan out your ideal account and work towards that. Im not sure which server it was but it was definitely T3. The version after 3.6 ... Pkx has been gone for a very long time. 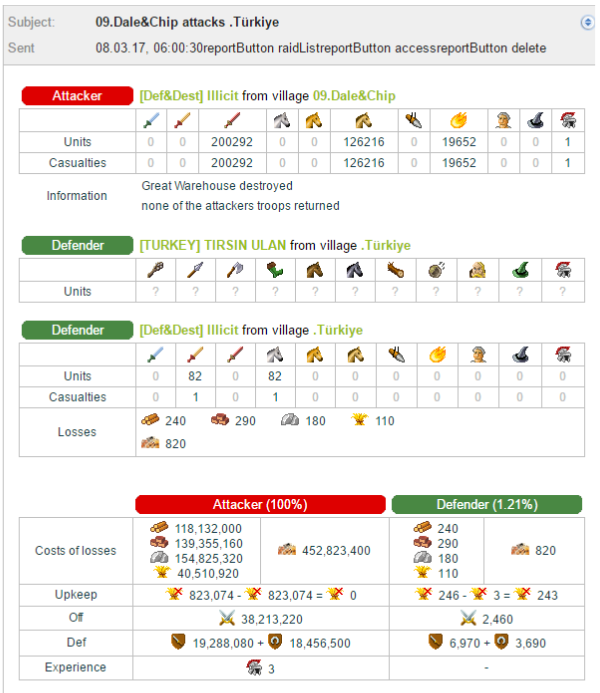 Eric, if you want this to be a guide, i would start with explanation of what CP is with links (or tables) of different building values and how much is needed for next village, screens where to see it etc. @Ameno It will be good to have CP value displayed on building screen the same way population is displayed for each level. The easiest way to bring new players attention to the subject and should be not hard to implement. As for HM20: it will take 33 days on slow server to recover the cost of HM10-20 on 7C with 150% crop available (not like there are plenty of those) and 70 days to recover cost of 2 25% crop oases. Resources can be spent more efficiently than that imho. Post was edited 1 time, last by ELE ( Jul 4th 2018 ). I will try it. It's midnight now and I need some sleep.